Source: U.S. Energy Information Administration based on SNL Energy. Note: Annual totals reflect operating capacity of generators for which the purchase and sale was completed within the calendar year. Large mergers and acquisitions are single transactions over 10 gigawatts of capacity. Electric power companies add physical capacity to their fleets in two primary ways: building new generators or buying existing generators from another company. The purchase and sale of power plants is a key business activity in the electric power sector. In 2012, over 107 gigawatts (GW) of operating capacity were bought and sold in the U.S. electric power market —the majority of which came from three large mergers or acquisitions— compared to about 26 GW of capacity additions from newly constructed plants (both actual and planned as reported to EIA). The 2012 data include capacity from three large electric company mergers: Duke Energy and Progress Energy, which closed on July 2, 2012; the Exelon Corporation and the Constellation Energy Group, which closed on March 12, 2012; and the acquisition of GenOn Energy by NRG Energy, which closed on December 14, 2012. An electric power company chooses to buy or sell a generator for a number of reasons including diversifying fuel mix, complying with regulations, taking advantage of distressed assets in the marketplace, or to free operating capital. 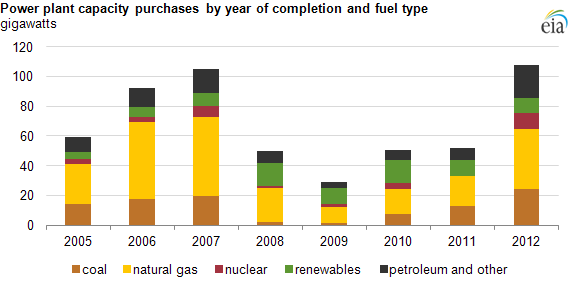 Natural gas and renewable units comprise a majority of the generating capacity bought or sold since 2005. Note: Annual totals reflect operating capacity of generators for which the purchase and sale was completed within the calendar year. Power plant acquisitions include the purchase of an entire plant site, a single generator, a share of a generator, or even an entire company. Recent examples of the latter include the merger of Progress Energy and Duke Energy and the acquisition of GenOn by NRG. A single generator can be owned by multiple entities. For example, the Palo Verde Nuclear Generating Station is fractionally owned by: Arizona Public Service Company (29.1%), Salt River Project (17.5%), El Paso Electric Co. (15.8%), Southern California Edison (15.8%), Public Service Co. of New Mexico (10.2%), Southern California Public Power Authority (5.9%), and Los Angeles Department of Water & Power (5.7%). Companies that purchase electric generating capacity include regulated electric utilities, independent power producers, industrial power users, municipal power companies, investment banks, and private equity investors. Transactions involving regulated electric utilities are often subject to approval from state public utility commissions. The purchase or sale of an investor-owned asset may or may not be subject to approval from state commissions or federal entities like the Federal Energy Regulatory Commission, Security and Exchange Commission, or the Federal Trade Commission. Citation was corrected to be Arizona Public Service Company on 1/17/2013.